With $20 billion in profits for 2010, and in the face of rising gas prices contributing to crippling worldwide inflation, oil giant Chevron met with opposition Wednesday as activists from across the globe converged at their world headquarters to give shareholders and executives a reality check about the ‘True Cost of Chevron’. Issues ranged from the massive contamination of the Ecuadorian Amazon to human rights abuse in Burma and elsewhere. 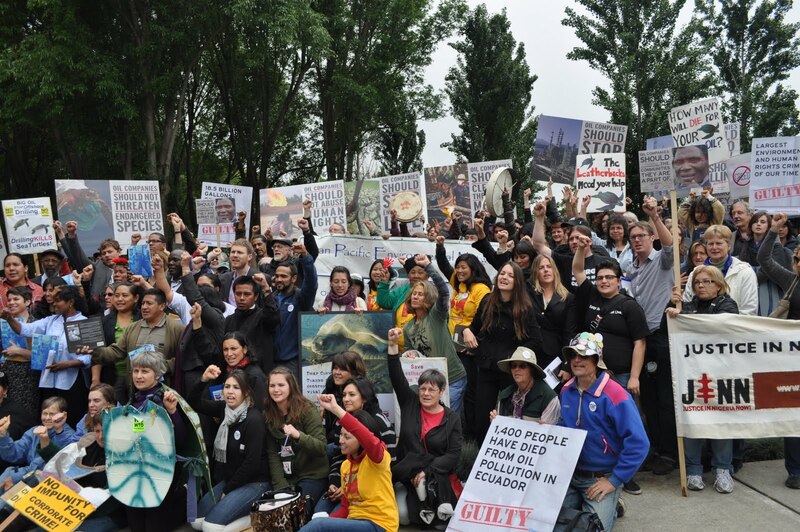 They have already been found guilty in Ecuadorian Court of having caused pollution in the Amazon at a devastating level, but Chevron’s lawyers continue to appeal and refuse to take responsibility for their devastating environmental policies. As one Chevron executive states, “It sure doesn’t look good, Chevron vs. the Amazon villages”. 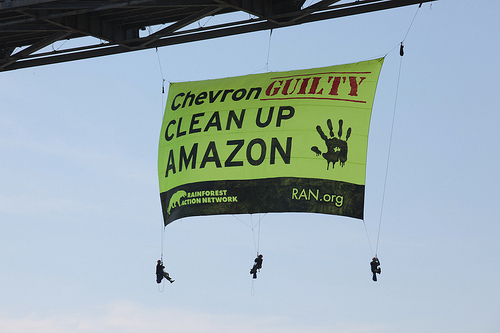 Earlier this week, advocates from the Rainforest Action Network in Northern California unfurled a 50’ banner on the lower deck of the Richmond Bridge blasting Chevron for it’s toxic legacy in the Amazon. 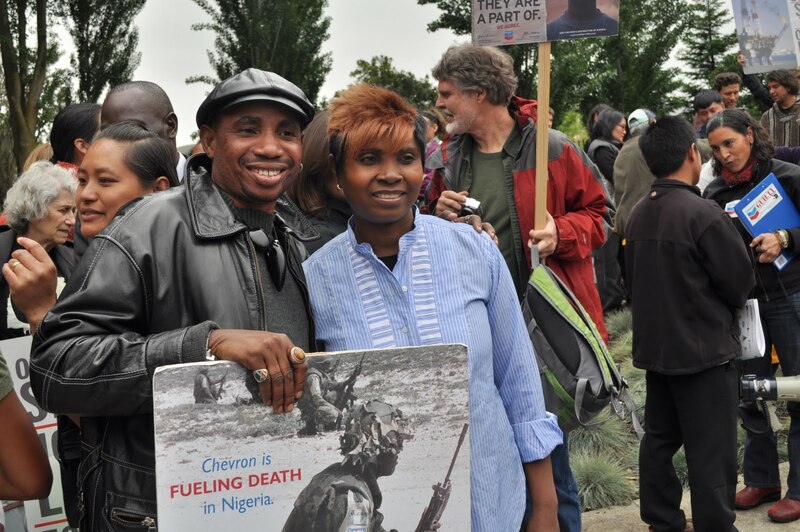 Representatives from Ecuador, Angola, Nigeria, Indonesia, Thailand, The Philippines, The Tar Sands region of Canada, Alaska, the Kimberly Region of Australia, Burma, and locals from Richmond, CA gathered to let Chevron shareholders hear about the true cost of maintaining our addiction to Chevron’s oil. 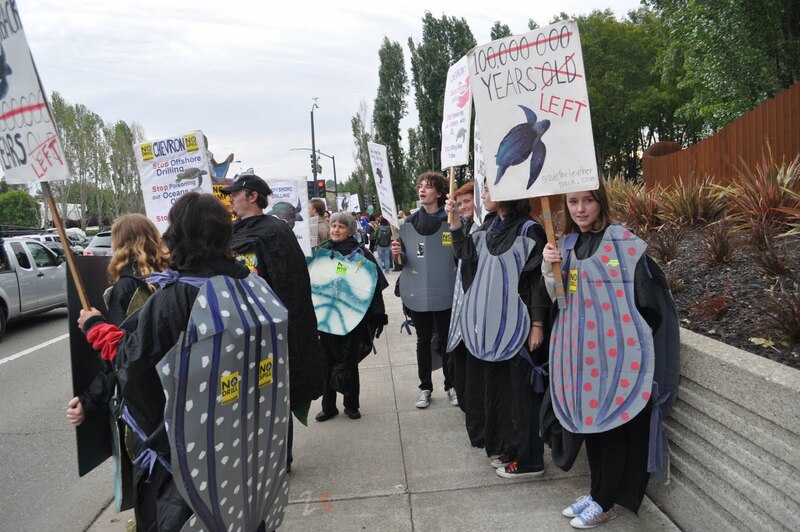 The folks from the Turtle Island Restoration Network were even there to represent the oceans and it’s creatures who cannot speak for themselves. After being banned from last year’s meeting in Houston, 22 speakers were at last able to address shareholders from the podium. It was heartbreaking to hear stories of entire families lost to cancer, to see the tears and suffering first hand. But Chevron has not yet agreed to pay the fines in Ecuador, and it continues to make plans to expand its oil ventures to other ecologically and culturally delicate areas. For me, having spent most of this past year focused on the mess that we have created in the Gulf of Mexico, today was a huge wakeup call. I saw stark evidence of worldwide human rights violations, ‘pollute and run’ tactics, and multiple levels of environmental devastation far beyond what I previously knew about. If you’d like to learn more about the havoc that Chevron has brought to the four corners of the globe, follow the links below.